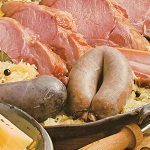 As Azeb scooped up pieces of her omelet with torn-off hunks of bread, as is the Ethiopian custom, I stabbed at mine with a fork and told her about my travels thus far in her country. But it was something I mentioned in passing that seriously broke the ice. Until this trip — specifically the day prior to our chance encounter, when I had driven down from Addis Ababa, the Ethiopian capital, to the southern part of the country — I had never seen a coffee tree. After all, great coffee is harvested all over the world — in Guatemala, Colombia, Indonesia, Kenya, and Rwanda, for example — but no coffee-producing country on earth can match the variety that grows in Ethiopia. By some estimates, nearly 99 percent of the world’s arabica coffee can be traced to Ethiopia. 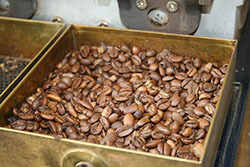 Moreover, according to aficionados, it’s here that some of the best coffee in the world is being produced. Every December and January, coffee-harvest time here, representatives of Third Wave coffee roasters — the smallish, hip U.S. coffee companies that take their java very seriously — materialize and scour the landscape for the highest-quality single-origin beans Ethiopia has to offer. This is Coffeeland. At Assefa’s two-story house, he and his housekeeper were poised to show me how Ethiopians have classically drunk coffee. Within seconds of my arrival, the housekeeper went to work: She lit coals and set a jabena, a traditional coffeepot that looks like a sort of lantern or bottle where a genie might live, on top of the coals to boil the water. Then she rested a pan with green (unroasted) coffee beans atop another container of burning coals. Finally, she lit some incense — frankincense — and the coffee making was in full swing. As large plumes of the scented smoke swirled toward the ceiling, Assefa and I chatted about coffee’s role in Ethiopian culture. Still, the coffee here is remarkable, especially the intense brew that is served ceremonially. After several minutes of preparation, Assefa’s housekeeper poured our first round into tiny, handleless cups. 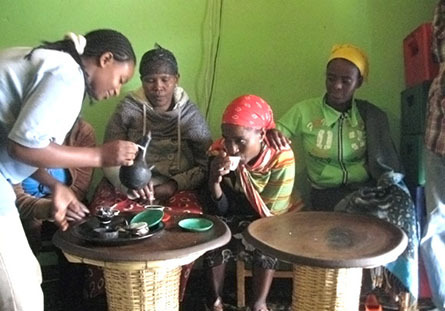 As tradition dictates, the Ethiopian coffee ceremony consists of three rounds, each with its own name. 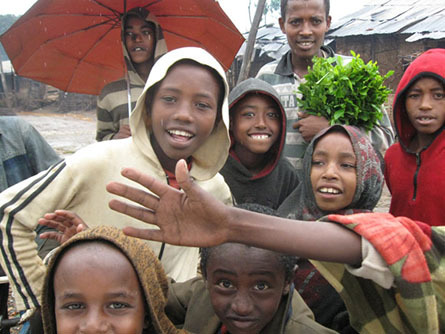 The first, called abolsimply means “first” in Amharic, the country’s official language. By the tona (second) stage, and certainly by the third, baraka, which means “blessing,” one is guaranteed to feel like bouncing off the walls from overcaffeination. 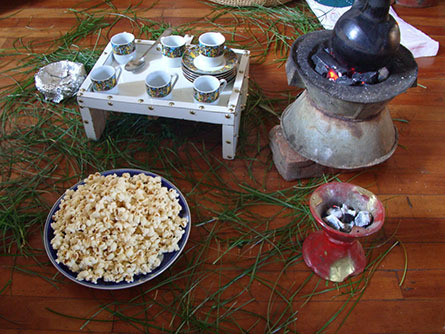 As Assefa and I sipped, we intermittently munched roasted barley, a traditional snack enjoyed with java here, and popcorn, a recent addition to the snack menu. The coffee was robust, with a taste stratum of citrus and floral lingering on the back of my tongue — a common Ethiopian flavor profile, especially for this coffee, grown in the Yirgacheffe region. The second phase of my coffee journey involved traveling around southern Ethiopia with Geoff Watts, co-owner and green-coffee buyer for the Los Angeles — and Chicago-based roaster Intelligentsia Coffee. This was Watts’s umpteenth trip to the Sidama Zone to scout out coffee. He spends up to eight months a year venturing into remote coffee territories around the world and cultivating personal business relationships with farmers. Third Wave roasters and retailers such as Intelligentsia distinguish themselves from mass producers and Second Wave businesses (such as Starbucks) by presenting coffee as an artisanal foodstuff. Further, Intelligentsia has pioneered the concept of direct trade — buying coffee directly from individual farmers. 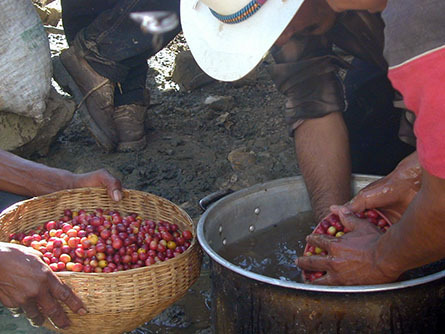 Unlike Fair Trade — a global, standardized certification system that guarantees organized farming groups a minimum floor price for their products — direct trade, as practiced by Intelligentsia, aims to build a sustainable business model based on individual relationships between roaster and farmer, and the assurance that farmers will always get a better-than-market price for their coffee. After Watts delivered his spiel at the washing station, he looked over at a farmer who had just turned up with a wicker basket full of cherry. “Oh, these don’t look very good,” he said. “You see, if you let all these green, unripe cherry go through the process, it’s going to create low-quality coffee. It’s like a 10-egg omelet — one bad egg will ruin the whole thing. I know you want to make money by bringing in all your cherry — ripe or not so ripe — but trust me, you’ll eventually make more money if you sort through this and include only the ripe cherry. That will produce very high-quality coffee. And you’ll get an above-market rate for it.” The farmer hung his head and slunk away, wicker basket in hand. As we drove back down the unpaved road toward our hotel in Dilla, the south’s major market town, we watched children trudge up the hill, jute bags full of cherry on top of their heads. Watts sighed. “This is what makes you mad,” he said. “You see these kids carrying bags up this hill, and meanwhile, back home in the U.S., some guy comes into a coffee shop and gets angry because he’s paying $3 for a cup of coffee. Two years ago, the coffee farmers around Koma were using the traditional sun-drying method, which generally yields a lower-quality coffee by too quickly and unevenly reducing moisture in the beans. 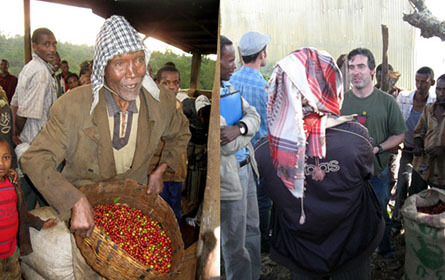 Farmers were receiving seven Ethiopian birr, or about 35 cents, per pound of coffee. Now, by using the new washing station that TechnoServe helped install and by switching to shade-drying methods, they are producing beans that fetch at least 35 birr, or $1.75, per pound — a 400 percent raise. As Watts and I walked back toward the truck — having just toured our last of dozens of washing stations over five days or so — eight of the farmers asked for a lift back to the village, a mile away. I sat in the back of the pickup with them, all of us watching the sun set behind the acacia-clad mountains. When the truck came to a halt, we shook hands and they jumped out. There were smiles and waves. The truck drove on, and I stayed in the back, standing up, as the figures of the men got smaller and smaller in my vision. The actor Hugh Jackman has even opened up a coffee shop in Tribeca that was inspired by his meeting a coffee farmer on a trip to Ethiopia. When I come upon Ethiopian coffee now, I order it — even when it costs more than $3 a cup.